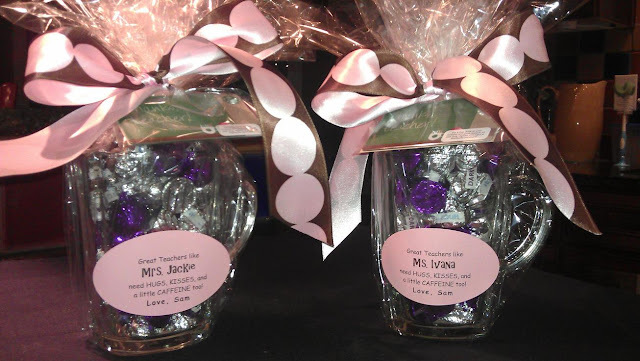 Especially since this is our first go ever at Teacher Appreciation gifts, I thought I'd show you our goodies day by day this week. I finished up all the shopping at Wally World this past weekend, so now I'm down to just assembling everything. Monday's theme is a "favorite thing" of the teacher's... and both of Sam's teachers love Starbucks. A sweet friend of mine shared an idea of giving Hershey's Hugs and Kisses with a note saying something about Sam's teachers needing lots of hugs and kisses... so I incorporated that with Starbucks. Sure they need hugs and kisses... but I'm bettin' they need some real caffeine too. I'm curious to see what other mommas bring... I just have no idea what the "standard" is, but whatever. I had fun with it and yeah, probably went a little overboard. But I love this kind of stuff and I really DO appreciate all the ladies that love on my sweet boy everyday. Mmm... what's not to love? Tomorrow's theme is "food" and yes... I will be baking. Look out! I think those are precious! As a teacher, the gifts that have a little thought put into them (whether it's from the kid or the parent) means a HECK of a lot more than the random generic gift. So cute! 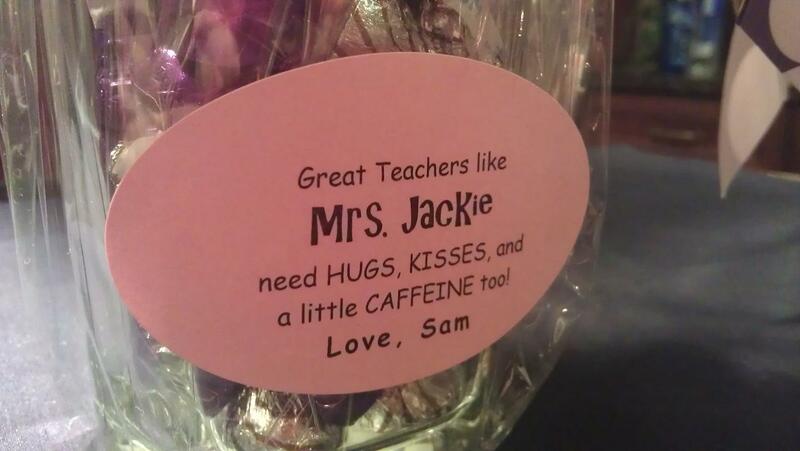 As someone who used to work as a Speech Therapist in a school, I can tell you that us teachers really do love these teacher appreciation gifts! Especially the ones that are hand-made and as cute as this! I always loved getting Starbucks gift cards and you can never go wrong with chocolate. Sam's teachers will really love these. You are so darn cute and you are making me want to do some crafting!! !